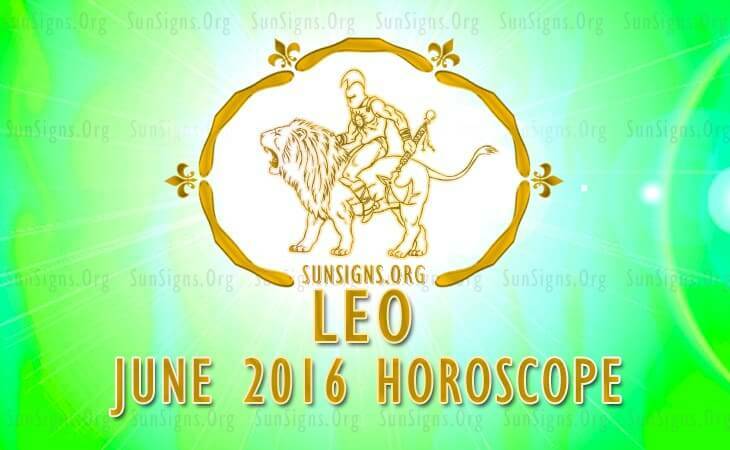 Leo June 2016 Horoscope foretells that career and personal ambitions are predominant during the month. There might be some issues at home that will need your attention. Relations between parents and children will need to be nurtured. Independence and personal interests will be important during June 2016 for the Leos. Issues concerning other people will be in the back burner. As the power of Self is not powerful enough, social skills are still necessary to accomplish your targets. The Leo astrology predictions for June 2016 forecast that you will be involved in the execution of a large project and it will test your tolerance limits. Persistence will help you in completing your business projects. The Leo June 2016 zodiac forecasts suggest that your interest in finances will be waning this month, but it has no effect on your earnings. You will have abundant fiscal opportunities to make money and your financial instinct will be high during the third week of the month. During the first week you will be forced to take major monetary decisions. Speculative ventures will yield good returns for the Lions in June 2016. Investments will be based on your emotions and not based on any financial strategy. Friends will be helpful in the achievement of your financial targets. In June 2016, planetary influences for the Leos will make social and love affairs sluggish. Your social discretion will be hazy and will affect your decisions in matters of love. Vital decisions on marriage or break-up should be taken before the 19th. Singles will come across romantic opportunities while engaged in humanitarian causes. Married Leos and those in serious relationships should examine their relationships and take steps to harmonize them. You will take time to look into your inner self in privacy towards the end of the month. Be patient before deciding to have a baby or getting engaged to your loved one. Health will get better in June 2016 for the Leos and requires proper care. Influence of Mars will be evident on your physical well-being with more dynamism and vitality. You should not go overboard and harm your health. Fitness can be boosted by regular exercise. This is a good time for sportsmen and athletes. Make sure to aid your fitness by having a healthy breakfast. To conclude, the June 2016 for Leo predicts that patience will be the key to all your problems this month.